This is an online course taught through Google classroom. Once you sign up, you will have six months to complete all activities and assignments in order to earn your continuing education (CEU) or license renewal points. Please verify with your school, school divisions, or state this course meets their requirements. Price includes cost of materials and shipping materials to your home. Class contains over $60 in free lesson plans you can use with your students! Course Description: The goal of science is to understand the natural world through a process known as scientific inquiry. 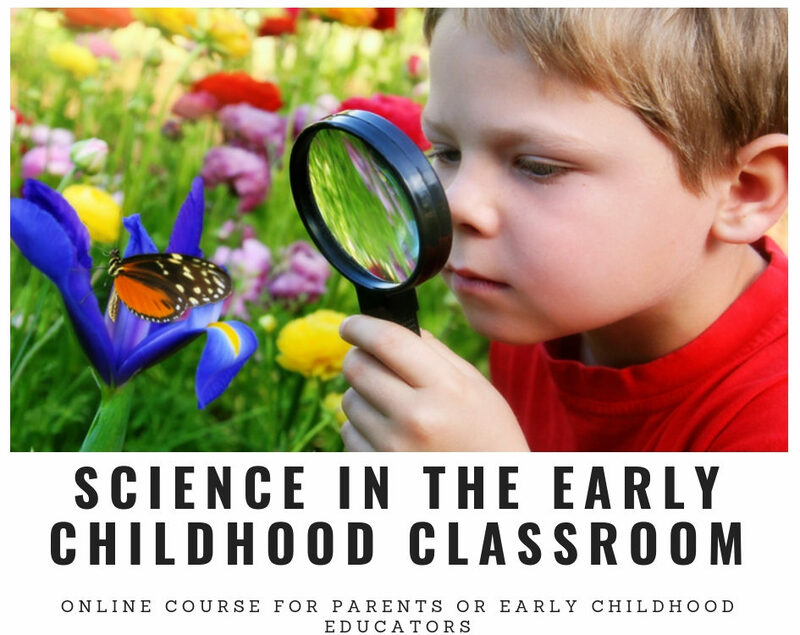 In this course we will look at ways to use simple activities to spark a young child’s curiosity while connecting to literacy elements. You will be required to spend between 7-10 hours a week on course materials in completing course activities and assignments. Some of the time will be spend doing the hands-on lessons with your own children/students! Materials for this course are included in the registration price. Course is worth 60 CEU’s or License Renewal Points. Certifications will be sent upon successful complete of the course. Check with your school district to make sure this course is approved. Week 1: What is Inquiry? During this week we explore what is inquiry through an activity using the strategy called See, Think, Wonder. Weeks 2 and 3: Essential Features of Inquiry. In this week we expand our understanding of inquiry through exploring the essential features that make up inquiry. Through hands-on activities, you will come to know these features and why they are important to science and other disciplines. Week 4: Designing Lessons to Get Your Young Learners Asking Questions. In this week we explore the use of the 5 E Model to design lessons. Again through a hands-on lesson focusing on color identification, you will come to learn the importance of engaging students in exploring first before you talk to them about any content or even read a book! Week 5: Designing Research Opportunities for Young Learners. Yes-your budding scientists can do research! Through analyzing a lesson, you will come to learn how to get your budding scientists do experiments! Week 6: Reflection. This week is your time to reflect on what you have learned and share your success stories! Course Start Dates: April 29th– Registration closes on April 5th. Materials will be shipped out the week of April 22nd. Please note there is no refund on this course option should you not be able to complete it within 6 months. I loved all the lessons and ideas she shared with us to use in our classroom. It was a very enjoyable course. Kara F.
The videos and all of the lessons/power points included with the class made it easy to implement the activities in my classroom! Everything we were asked to do was directly related and ready to use in our classroom. I am so glad I was able to take this course and look forward to implementing the strategies I have learned in my everyday science lessons. Thank you! Kayley M.